Haywood Homesteaders: Oh lordy Karl is going to build an Ornithopter! Anyone who ever doubted that TV is evil- I now have proof. 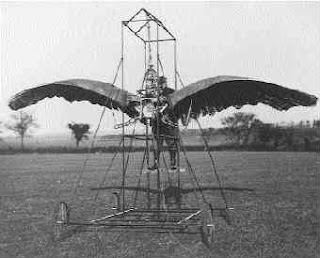 Karl has just been inspired by a TV commercial to build an Ornithopter- alas not inspired by DaVinci- the man with the vision- but a COMMERCIAL! Even worse- he is not motivated to fly- but has hopes our neighbors will think he is crazy and keep their distance. I had hopes today to wax poetic on the virtues of hard work- Spring is nearing and the snow is melting. Karl and I spent the day cleaning the flower beds, mulching and doing a general cleanup of the garage. The weather was beautiful and the honey bees were flying about looking for early blossoms. We rest this evening with realization that we will definitely feel this tomorrow. Somehow - I just don't think we will be able to stomach the Academy Awards. Thirty minutes of "Karl-Mentary" on the events of the red carpet has ruint it fer me. I guess I am off to work on my planting schedule and a cup of tea.